If you all missed it, Square released a pre-E3 Kingdom Hearts II.5 HD Remix trailer a few hours ago. The nostalgia and emotion no doubt gripped us all as we saw some of our favorite scenes in their full HD glory, and I'm sure many of us would have been happy just with the December 2nd (NA) and December 5th (EU) release dates confirmed. Square Enix decided to take an extra step and tease some information about the in-development Kingdom Hearts 3. Announced at E3 last year, we've had precious few updates on it since. Unsurprisingly, the teaser was short and rather cryptic, fitting for the Kingdom Hearts series. Let's take a look, shall we? General warning: spoilers up to and including Dream Drop Distance are fair game for this post! We can of course only speculate on Kingdom Hearts 3, but if you're not quite up to date on the series & don't want to be, don't read ahead! Recently, an internal Square-Enix Europe document (pictured below) has been circulating on the internet, containing information about their soon-to-be-released titles (like Lightning Returns: Final Fantasy XIII) and titles still in development (notably Final Fantasy XV and Kingdom Hearts III). Suffice to say, Kingdom Hearts 3 won't be hitting the shelves anytime soon. From interviews and appearances, it's safe to say that the final chapter of the Xehanort Saga is still in very early development -- it's far too early to consider a release date, but that won't stop us from speculating! Anyone have predictions for a more realistic time frame? The most recent Famitsu weekly holds opinions for the Sony console by notable game developers Goichi Suda, Tetsuya Nomura and Yoshinori Ono. Kotaku has translated and posted each developers opinions on developing games for the Playstation 4, and Nomura's portion can be read below. Hello loyal members! With all the interviews and updates given with the upcoming Kingdom Hearts chapter, this thread was created to organize and compile them. Now you can pick and choose what you'd like to read about, as this thread will be constantly updated with each new bit of info on the long awaited Kingdom Hearts 3! Be sure to check back every now and again to get your KH3 news fix. June 10 2013 Kingdom Hearts 3 is announced No, really they announced it! Trailer and Logo are shown. June 11 2013 Square Enix Press Release Square-Enix's press release regarding Kingdom Hearts III, revealing the main plot. June 12 2013 Famitsu Interview with Nomura Famitsu's sit-down with Nomura to discuss both Final Fantasy XV and Kingdom Hearts 3. Reveals information on the next gen engines and the possibilities that comes with it. June 14 2013 Degenki and IGN Interview with Nomura Short Interviews on the possibility of franchises that Disney has recently acquired. Nomura also states that the trailer shows only possibilities. June 20 2013 Edge Online Interview with Nomura Nomura's point of view regarding E3 and the next generation of consoles. June 24 2013 New Character artwork released A released CG Image depicting Sora, Donald, and goofy in their Kingdom Hearts 2 attire. June 28 2013 Degenki Playstation Interview with Nomura Not much revealed here. tidbits of info on the trailer's textures and enthusiasm regarding the world selection process. July 2 2013 Famitsu Interview with Nomura Information on more possibilities concerning enemies, battle styles, and visuals. July 7 2013 Finaland Interview with Nomura at Japan Expo 2013 Nomura discuss his heavy involvement, along with potential co-op, playable characters, and costume designs. He also states that he wishes to include Star wars. July 8 2013 KHDestiny and KHIsland Interview with Nomura at Japan Expo 2013 Some more development updates on Kingdom Hearts III. Possibility of announcing 2.5 HD ReMix at D23 Expo in October. July 16 2013 RPG Site Interview with Nomura Nomura talks development teams, as well as reasons for spin-off games. July 28 2013 Los Angeles Times Interview with Nomura Nomura talks KH philosophy and series continuation. August 30 2013 Kingdom Hearts 3 will be at Tokyo Game show Title description. September 13 2013 Here's some ridiculously hi-res Kingdom Hearts III art for you Title description. September 25 2013 IGN Interview with Shinji Hashimoto (News on KH3 and the possibility of 2.5 HD ReMix) Hashimoto's views on tending to the needs to make Kingdom Hearts 3 great, as well as the possibility of a 2.5 HD ReMix. October 15 2013 Kingdom Hearts III - D23 Expo Trailer Brand new trailer from D23 in Japan. October 16 2013 Kingdom Hearts 3 Creator's Interview with Tetsuya Nomura Nomura discusses hopes for the specifications to come with KH3 on the next advanced console. "More Dynamic Possibilities." March 31 2014 New KH3 Possible at E3 2014 Here's hoping! September 17 2014 Nomura leaves Final Fantasy XV to focus on KH3 With the Final Fantasy title nearing completion, Nomura aims his creativity to the long awaited sequel. September 24 2014 Famitsu: Kingdom Hearts III Interview with Nomura Development updates on choosing worlds, fighting styles, and more! October 1 2014 Message on KH3 from Tetsuya Nomura Nomura wishes to increase the challenge possibilities! October 7 2014 Kingdom Hearts III is now using Unreal Engine 4 For the sake of graphical rendering issues. December 1 2014 New KH3 Info Revealed at 2.5 HD ReMix Event Another teaser shown in private! A description of the scene is depicted though. January 23 2015 Square-Enix Currently Hiring for KH3 Square Enix reaches out for programmers and designers in Osaka. June 16 2015 New Trailer shown at E3 2015 Trailer features more attacks, heartless, cutscenes, and a new outfit for Sora. Worlds based off "Hercules" and "Tangled" can also be seen. June 16 2015 Everything you missed about Kingdom Hearts at E3 A detailed summary of all the trailers and events for Kingdom Hearts at E3. June 16 2015 Ben Diskin confirmed to return The voice of young Master Xehanort confirmed his involvement in the E3 trailer via twitter. June 16 2015 Discussion with Roy Conli about Tangled The producer for the 2010 film "Tangled," discusses the collaboration process with Square Enix to incorporate the movie into the game. June 16 2015 High Quality trailer and Screenshots Enhanced media from the KH3 trailer at E3. June 17 2015 Nomura Shares More About The KH3 Trailer to Dengeki Nomura discusses "Attraction Flow," which features the theme park attractions that can be used in battle. June 17 2015 Nomura Interview with Engadget Nomura discusses online features, gameplay, and the amount of worlds in the game compared to earlier titles. June 19 2015 KH3's foundation is nearly complete Nomura affirmed that the basic framework for Kingdom Hearts III is nearly finished! 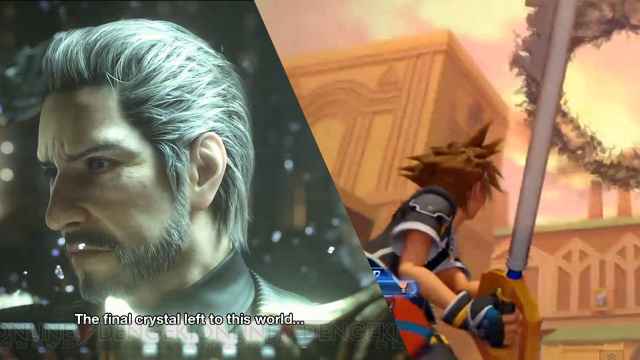 June 19 2015 E3 2015 Trailer Analysis A video analysis highlighting some of the more subtle aspects that stood out. June 27 2015 8 Things You Need to Know About Kingdom Hearts III Eight points of interest for fans regarding the development of KH3, with some being quite insightful as to the relationship between Square and Disney, as well as hints of what to expect in KH3. August 16 2015 Big Hero 6 World confirmed Announced at D23 2015, Roy Conli confirms! December 18 2015 Brand New Kingdom Hearts III Trailer A bit of new gameplay footage featuring Sora. September 26 2016 Kingdom Hearts III Recording underway Revealed by Nomura during a Dissidia livestream. July 15 2017 KH3 D23 2017 Trailer + KH3 Coming in 2018! Toy Story confirmed as a new world! The game is also slated to release sometime in 2018. July 16 2017 Tetsuya Nomura Talks KH3 Gummi Ship w/ Game Informer Gummi Ship system slated to return. July 16 2017 More Details Revealed about Toy Story World The Toy story plot in KH3 is set to take place between Toy Story 2 and Toy Story 3. July 16 2017 Tetsuya Nomura Interviewed by IGN Nomura mentions Second Playable Character, no D-links, higher tier magic, a possible Switch Version and more. July 17 2017 More Information Revealed About Keyblade Transformations and Summons Nomura discusses the new keyblade modifications as well as a new gameplay mechanic called "Athletic Flow." July 18 2017 Famitsu Interview w/ Tetsuya Nomura The Disney movies selected for KH3 will be less than KH2 and will not have any movies after Big Hero 6 (2014) being featured. More information inside! December 15 2017 UNCONFIRMED Leaked Screenshots Show New World Images supposedly found in an FTP server showcase a new world based on the film "Monsters Inc." The images are detailed, showing Sora, Donald and Goofy in new monster forms as well as Mike and Sully in their party. Unversed are also shown. February 10 2018 D23 Expo Japan 2018 KH3 Trailers Two new trailers confirm the inclusion of a Monsters Inc world, the return of Vanitas and Marluxia, and dream eater summons. New reveals also showcase new clothes for Riku and Mickey as well as a new theme song by Utada Hikaru; "Oath." (also known as "Don't think twice" in English). February 10 2018 KH III Development Info from IGN Japan; Gummi Ships, Tangled World, and... Mickey's Giantland? Development update on the process of rendering Rapunzel's hair, rare heartless, and the inclusion of Mickey's Giantland; a 1933 Disney short. February 12 2018 Kingdom Hearts 3 Renders and Screenshots New character renders of Sora, Donald, Goofy, Mike, and Sully from the Monster's inc world. Also shown are new renders of Riku and Mickey. Riku's new keyblade is shown! April 16 2018 Union X Character to be a Summon in KH3 According to information from one of the panels at the Kingdom Hearts Union X event, a new summon in Kingdom Hearts III will be from a Union X world! June 10 2018 Kingdom Hearts III Releasing January 29, 2019 After 5 years, we finally have a set release date! June 11 2018 New Kingdom Hearts III trailer from Square Enix E3 presentation Reveal of the new Frozen world, the return of Larxene, a Simba summon and more! June 11 2018 Final Kingdom Hearts III E3 Trailer Released Confirming the return of Port Royal and Luxord, as well as giving us our first look at Kairi and Lea, and many more surprises! June 11 2018 Kingdom Hearts III special editions available for pre-order In a new press release, Square Enix has detailed two special editions that will be available for Kingdom Hearts III! June 26 2018 Full version of Chikai/Oath, the Japanese theme of KHIII, surface online! KH3's official Japanese opening theme is released!